Line-of-sight light sensor detects an arc as small as 3 kA within a 2-m half-sphere. Sensor health and trip indication. The PGA-LS10 optical sensor is designed to collect light over a wide angle and with high sensitivity. For fast fault location, front-panel and sensor LED’s indicate sensor health and which sensor detected an arc fault. 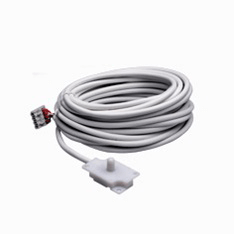 The arc detecting point sensor PGA LS10 is installed in switchboards in such a way that it has a line-of-sight to all powered connections, where an arc can develop. Typically, each compartment will have one or two sensors. The sensor is able to detect light from all angles in front of it due to the specially shaped cylindrical lens on the front of the sensor. The detection radius is dependent on the arc power. At a trip level setting on the PGR-8800 of “1”, the PGR-8800 will react to all arcs of more than 3 kA within a 2 meter radius.